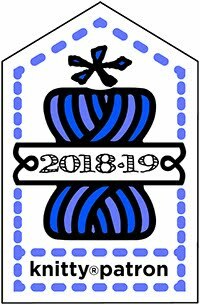 It's our third pre-Sockalong post ... the start date is getting closer! 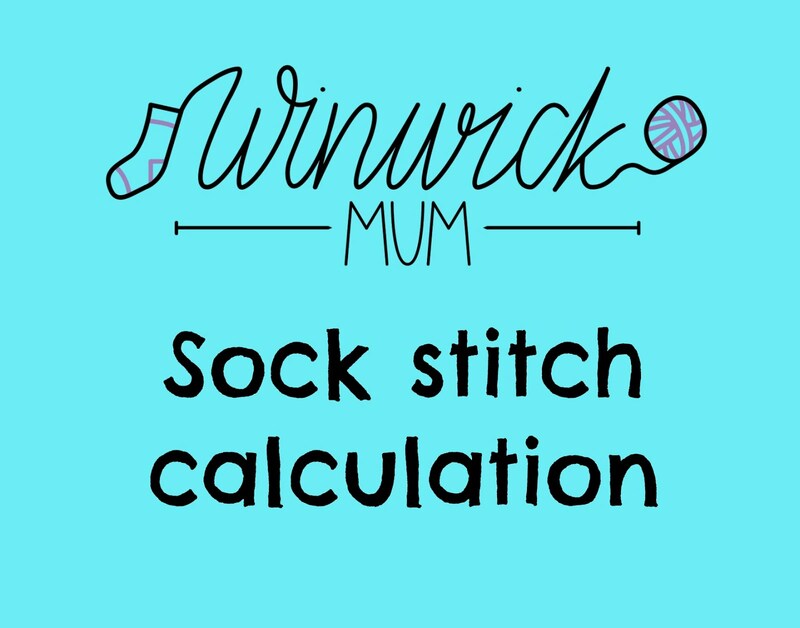 If you are looking for the sock stitch calculation, scroll down! Hello to everyone who's already said they're joining in, and if you're finding these posts for the first time, it's not too late. 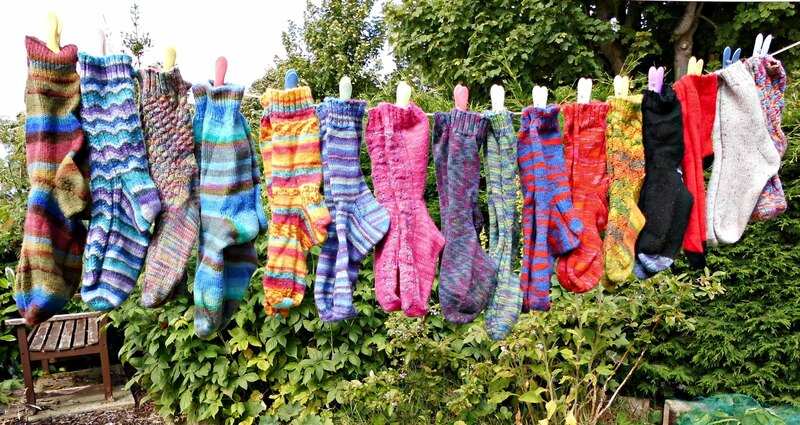 The Sockalong starts on Sunday 3 May so you've got time to have a look at the pattern, choose some yarn and make sure you've got some needles. Let's start by taking another look at the ball band on the yarn. 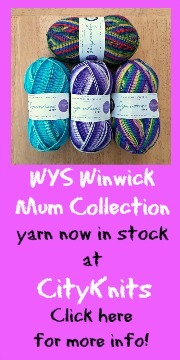 This the yarn I'm going to be using which I talked about the other day. 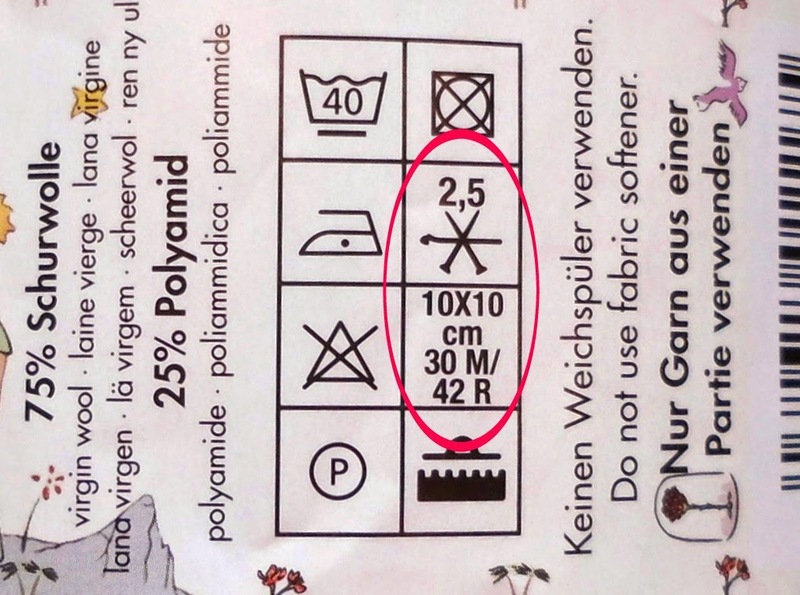 You can see the symbols panel with the washing instructions and the gauge information quite clearly. If we take a closer look again then you can see that in the red oval is the recommended needle size - 2.5mm - and underneath that the number of rows and stitches the manufacturer says you should get knitting on 2.5mm needles. Based on a 10 x 10cm (4 x 4 inches) square, you should get 30 stitches (M) and 42 rows (R). If you know that you will get that number of stitches and rows without checking, then that's fine and you can put your feet up until the next post. However, if you've never knitted with the yarn before or you're not quite sure, then it's always best to check. Knitting in the round gives you a different tension to knitting on straight needles so it's worth taking the time to see exactly what gauge you're knitting to. 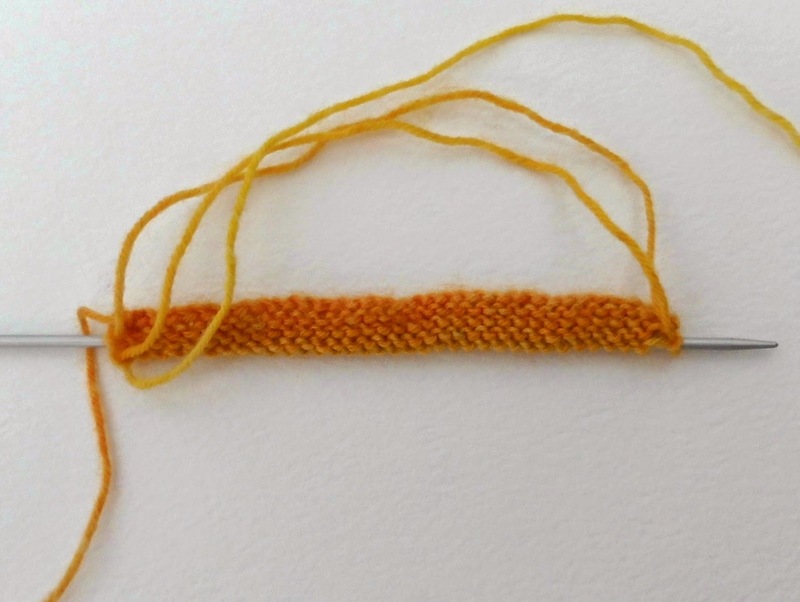 Additionally, you can use the number of stitches in your swatch to help you work out how many stitches you will need to cast on for your sock. For a sock, the most important thing is to know the number of stitches per inch so working out the number of stitches to expect to get in one inch (using the ball band above: 30 stitches ÷ 4 inches = 7.5 stitches) is helpful before you start. It’s not essential to make a huge swatch – just big enough to measure your stitches is fine - but I’m going to show you the process below. Generally, I use 2.5mm needles for any sock yarn even if the ball band suggests differently, and it usually works out at 7-8 stitches per inch. I'm going to show you the swatching method used by Elizabeth Zimmerman which makes shorter work of the gauge swatch than having to cast on enough stitches to knit a whole sock. 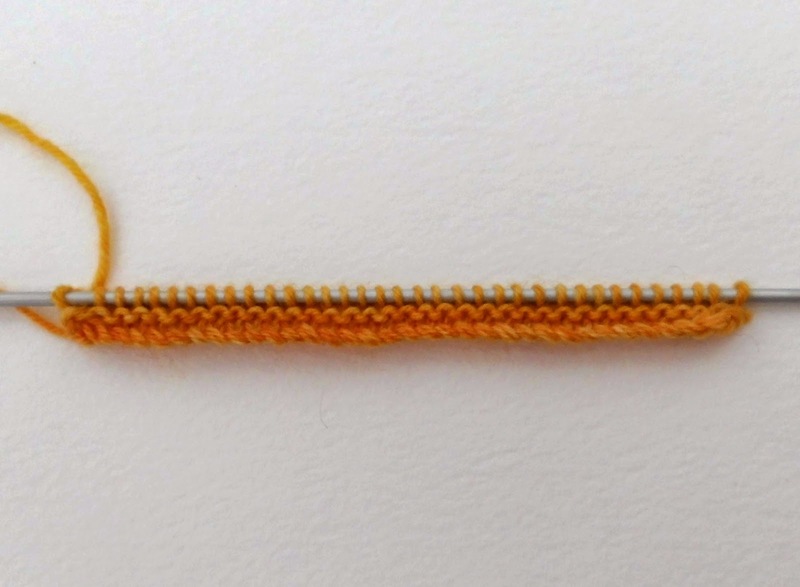 In this example, I'm going to cast on 35 stitches to give me a margin at each side of my swatch (remember the ball band says I should be getting 30 stitches to 10 cm?). This will make it easier when I come to measure the stitches. First things first, you need to cast on, and it's always best to use the type and size of needles with which you're going to be knitting your sock then you know exactly how your knitting will work out. For this example, I'm going to show you how to knit the square using DPNs but the process is the same whichever needle you use. There are no hard and fast rules about casting on for socks; you can pretty much use whichever cast-on you like and you might find that you change your mind from sock to sock depending on the pattern you use. 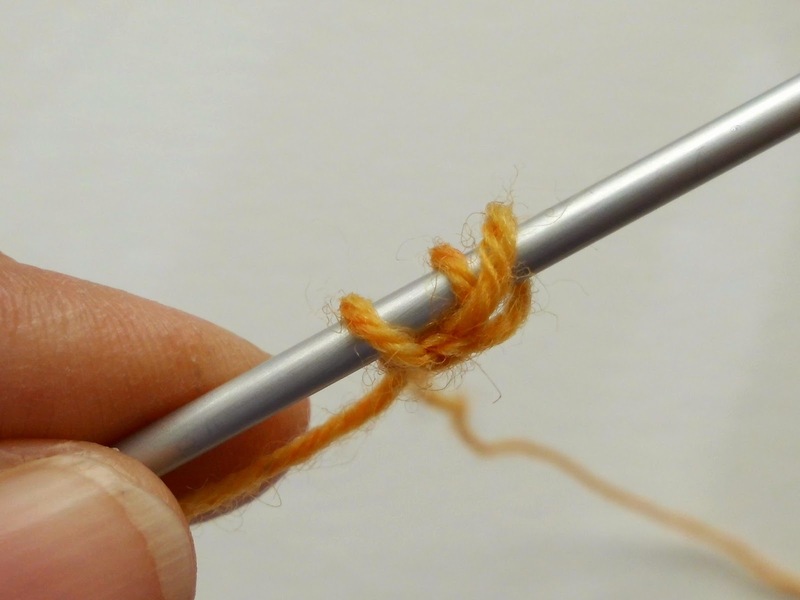 My preference is the cable cast-on and I'll show you how to do it in case you've not come across it before, but it really doesn't matter as long as you cast on the right number of stitches. 1 Make a loop and slip it over your left needle. Put your right needle into the loop knitwise. 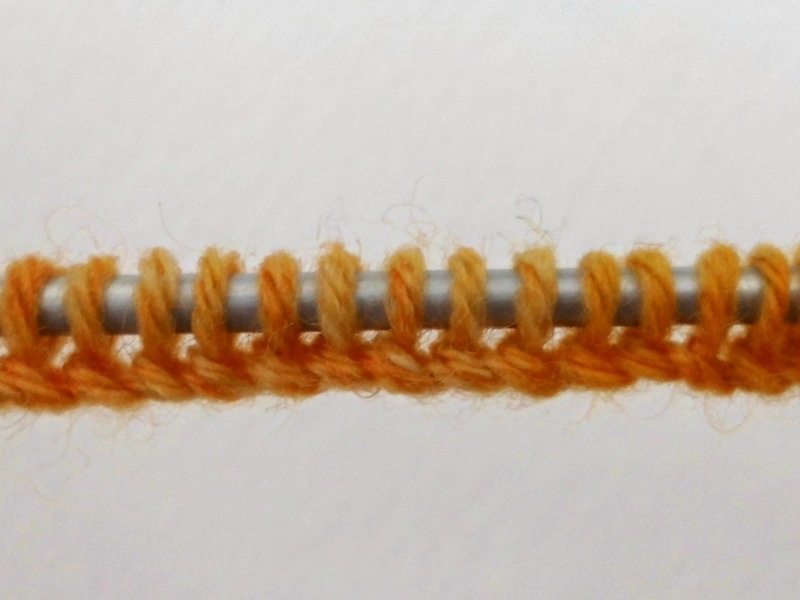 2 Put the yarn over the needle and pull it through as if you were creating a knit stitch, but instead of sliding it off the needle, put it over the end of the left needle to create a second stitch. 5 Continue until you have the number of stitches you require, remembering not to pull the stitches too tight on your needle. When it comes to your sock, you'll need to take a view of how tightly you cast on - this might be dependent on the cast-on method you choose. I cast on with a size bigger needle and others cast on over two needles to make sure that you don't pull the stitches too tight. Once I've cast on the right number of stitches for my swatch, I work two rows of garter stitch (knit both rows). This helps to stop the end of my work rolling up too much. Next row: knit across all the stitches, but instead of turning the work and purling back across the row, leave a long length of yarn, go back to the beginning of the row and knit the row again. This gives the same effect as knitting in the round as you don’t have a purl row. It looks a bit messy on the back but it does the job! Once you have worked the size of square that you need, you can measure your work. It's quite acceptable to work less than the required 10cm as long as you do the maths to work out the number of stitches per cm to get the number you should be working to. 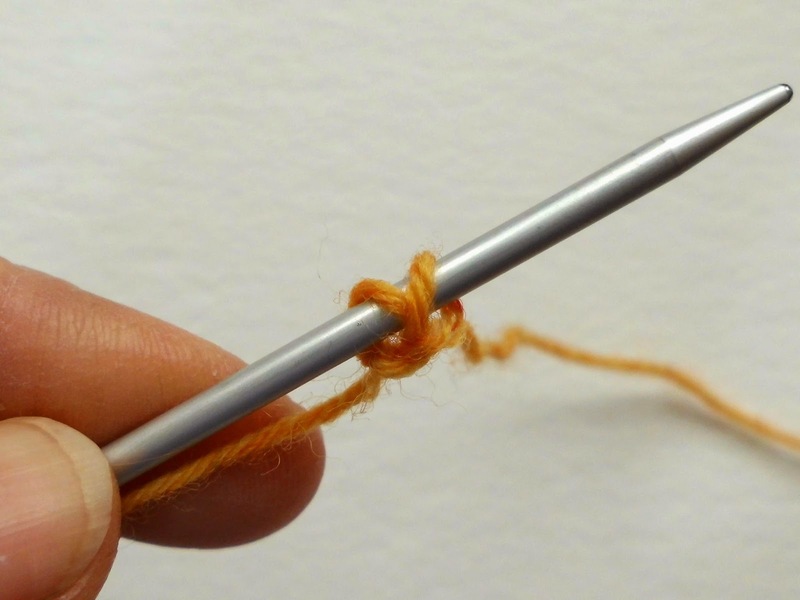 If the number of stitches in your tension square match those on the ball band, then you’re knitting with the right size needles. 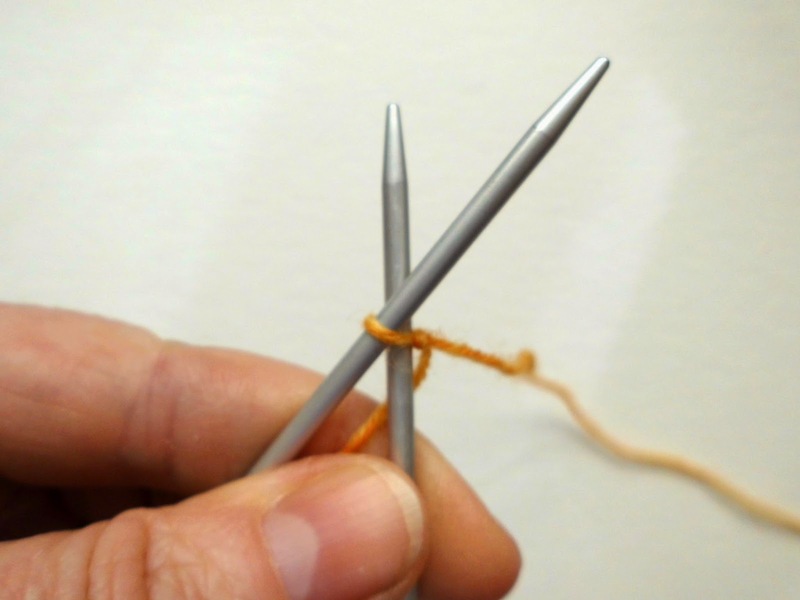 If you’ve got more stitches, try going up one size to a bigger needle and if you’ve got less, try going down one size to a smaller needle. 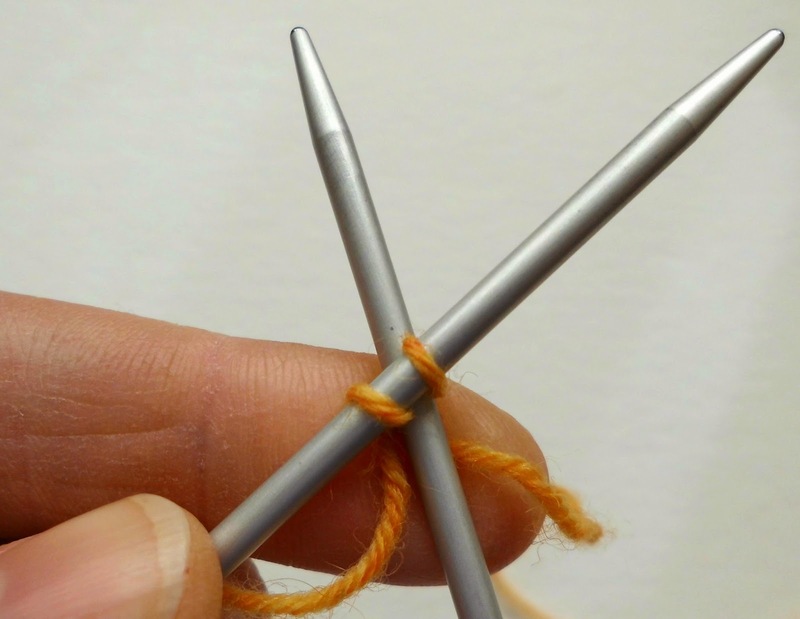 If you're not able to change your needle size, another alternative is to cast on more stitches so that you get the right diameter for your foot; you will need to increase the pattern we're using by 4 stitches each time. Some people like to keep their tension squares and collect them to make into blankets, but I never do. Once I know the information I need, I just unravel it and wind it back onto the ball ready to use for my socks. That's all there is to it - it's not hard, is it? My problem is that I'm usually too impatient to get started to want to knit a tension square but experience has taught me that being too impatient to get started often leads to having to start more than once! Finally before we finish today, let me show you how I use the gauge information to work out the sizing for my socks. If you search the internet, there are plenty of methods for working out the number of stitches you will need, some of them based on foot width and others on calf or ankle size. A good method, which can be adapted to any sock yarn, is this one which takes into account the size of your feet and the tension that you knit to. 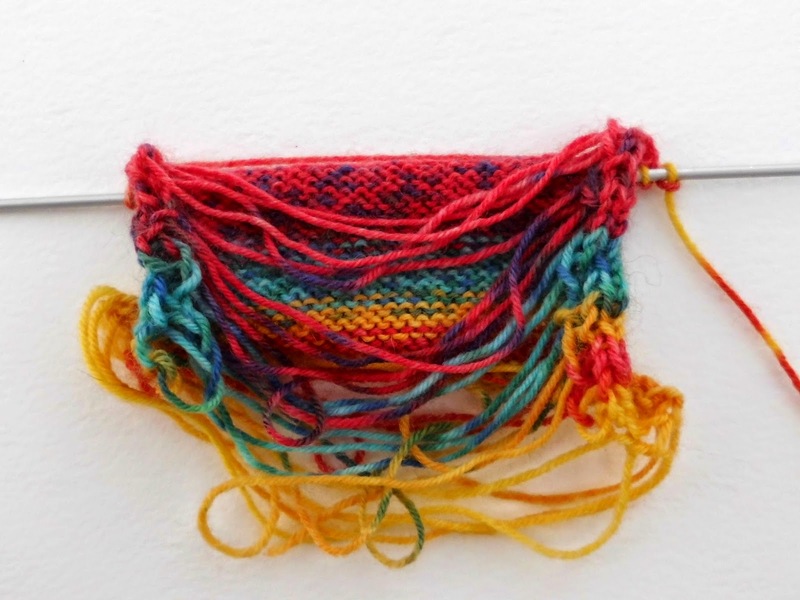 The number of stitches that you choose to cast on must always be divisible by 4, so choose the nearest multiple of 4 to the result that you get from your stitch calculation. 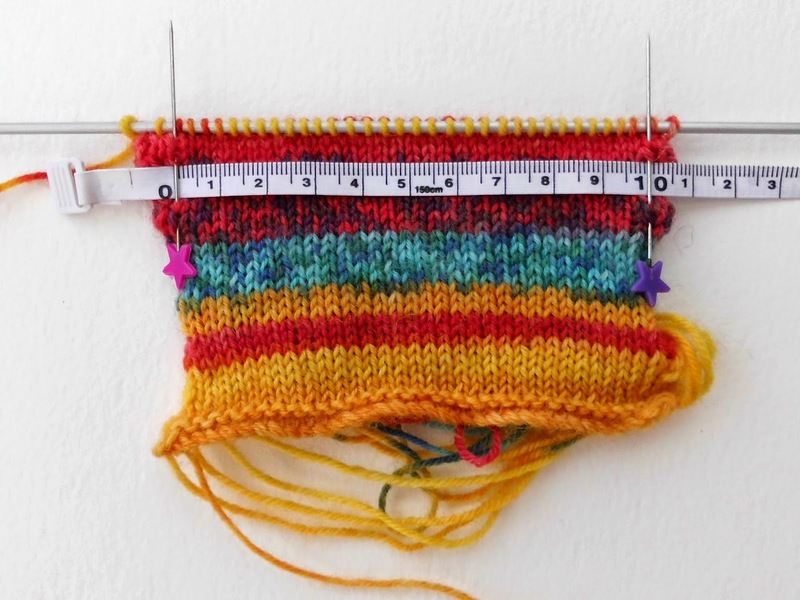 Measure around the ball of your foot (in inches) and multiply that measurement by the number of stitches per inch from your swatch. 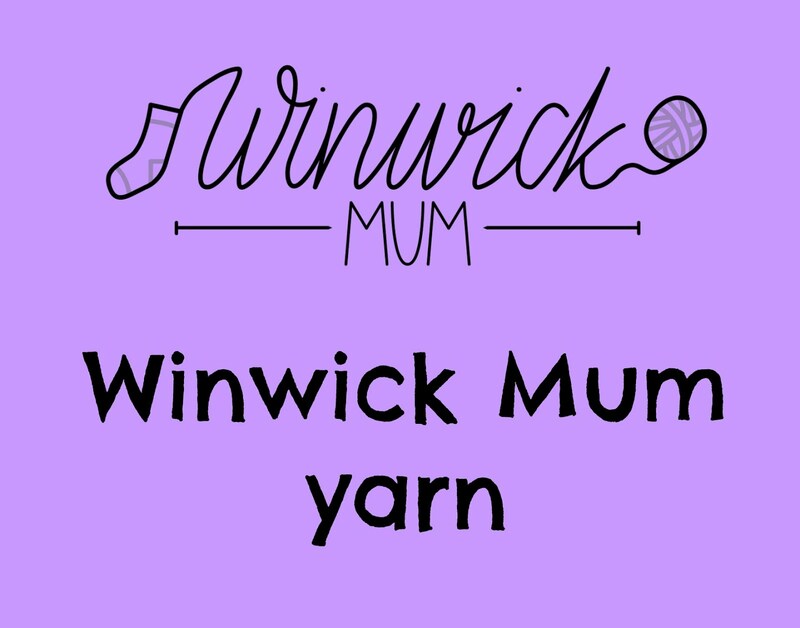 Next, you need to allow for the negative ease (stretch in the knitted fabric) so take 10% off the total – in my case, 10% of 64 stitches would be 6.4 but it’s easiest to round it up or down to the nearest whole number. 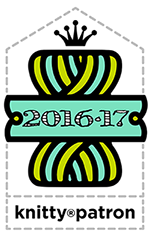 This would make the new calculation 64 (original number of stitches) – 6 (10% negative ease) = 58. 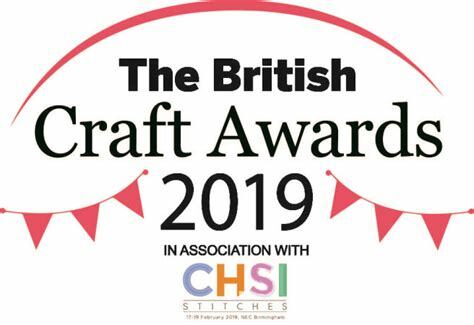 Remember that the number of stitches that you cast on needs to be a multiple of 4, so I could cast on either 56 or 60 stitches – I think that 56 would be just bit too tight so I am going to choose to cast on 60 stitches. 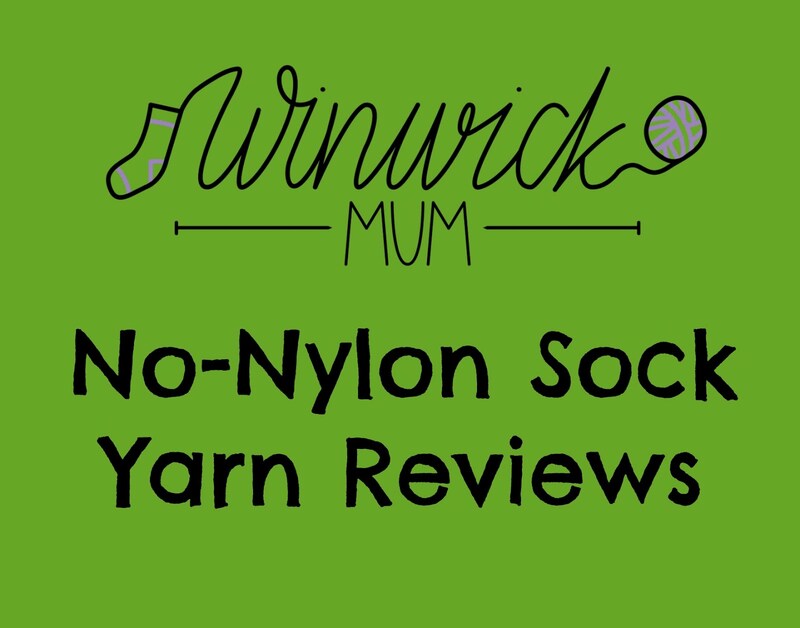 It’s generally better for your sock fabric to be tighter than, say, for a jumper as that makes it more hard-wearing, but you don’t want it so tight that it pulls across your foot. In the end, the gauge becomes a matter of preference – some people like tighter socks, others prefer looser socks and as you complete more pairs, you will see which you prefer for yourself. The nice thing about hand-knits is that you can try your socks on at every stage to make sure they are going to fit perfectly. 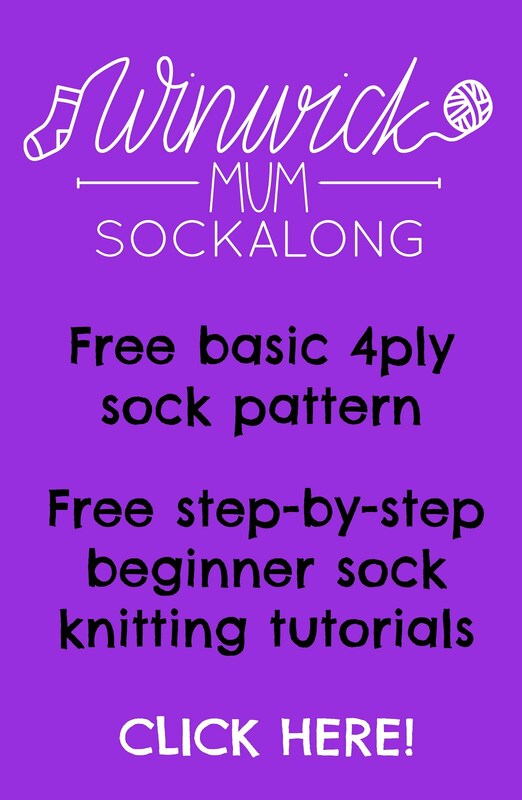 You can use this calculation for any weight of yarn and the pattern and tutorials will also work with any type of yarn, so there is no limit to the socks you can make! 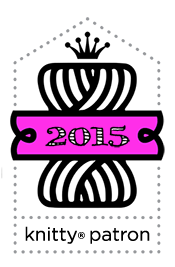 Next week, we'll talk about accessories and then the countdown really begins! 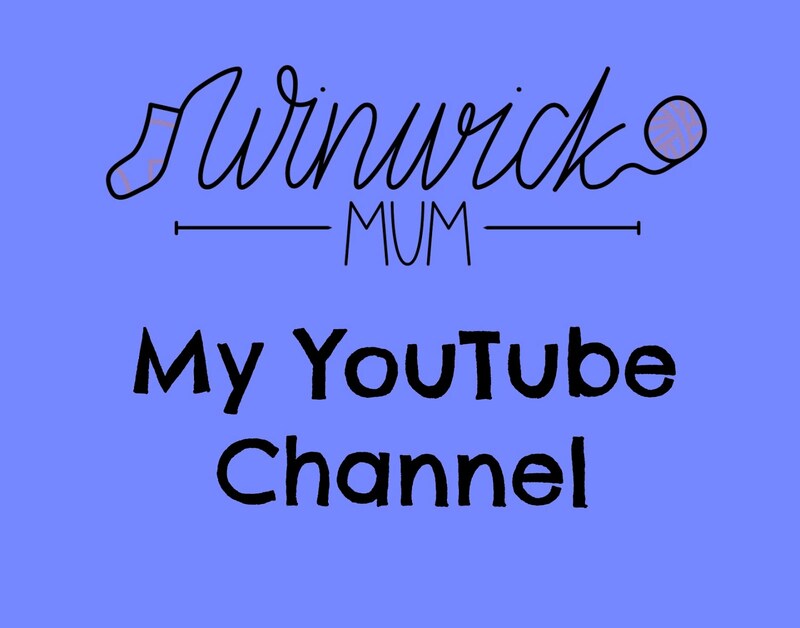 Don't forget to ask any questions - it's helpful for everybody if you've thought of something that I've not mentioned. Thanks again to everybody who's going to join in whether you've commented or not; it's great to think that lots of pairs of socks are going to be ongoing at the same time! Thank you for all the info. Your sockalong may be the thing that actually gets me knitting socks rather than just thinking about it! Love your blog, it's refreshing to read 'normal life' blogs. 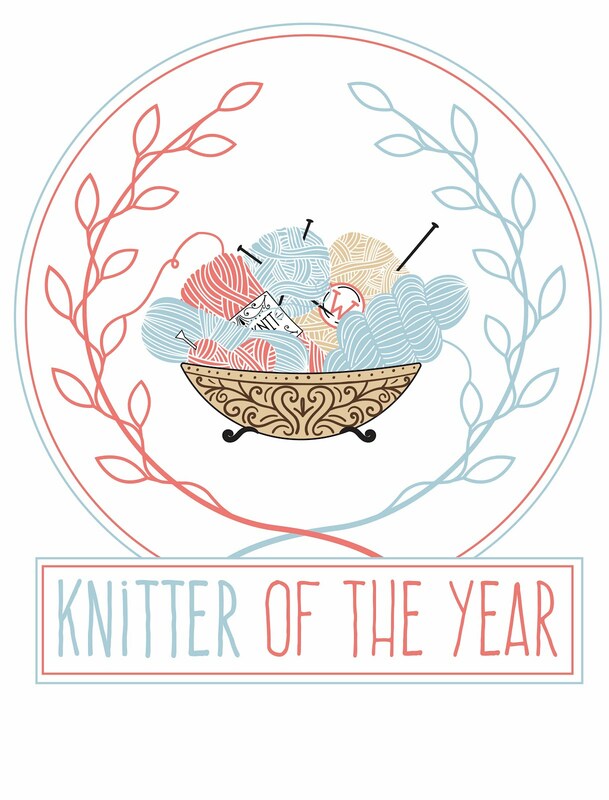 Do you knit continental or English style with your short circular? 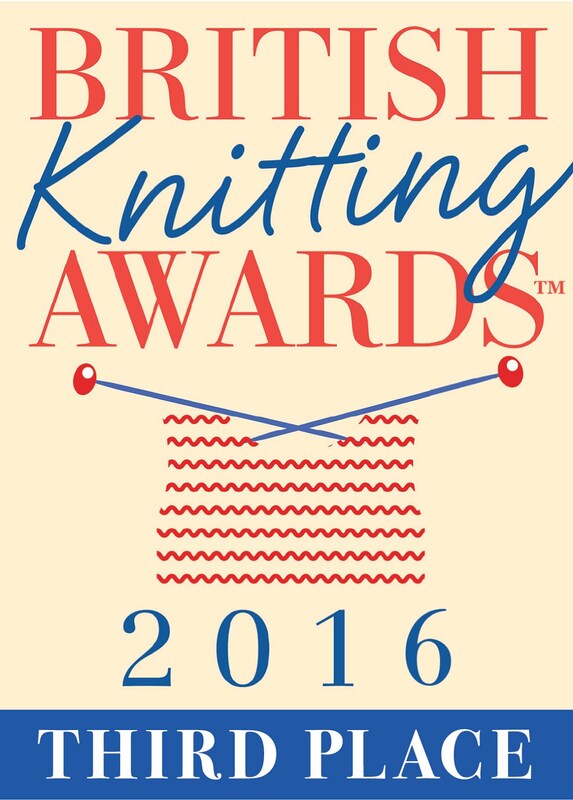 English, although I did try Continental when knitting a fairisle jumper so I could hold one colour in each hand. Can't get the hang of purling though! I'm really enjoying my swatch. It's ages since I knitted anything as I've been seduced by Lucy's gorgeous creations at Attic24. Bit of simple knitting in front of the World Snooker Semis - heaven. Hi there, do I need to worry about the number of rows in my swatch as long as the number of stitches is accurate? I'm not terribly fond of swatching, can you tell! 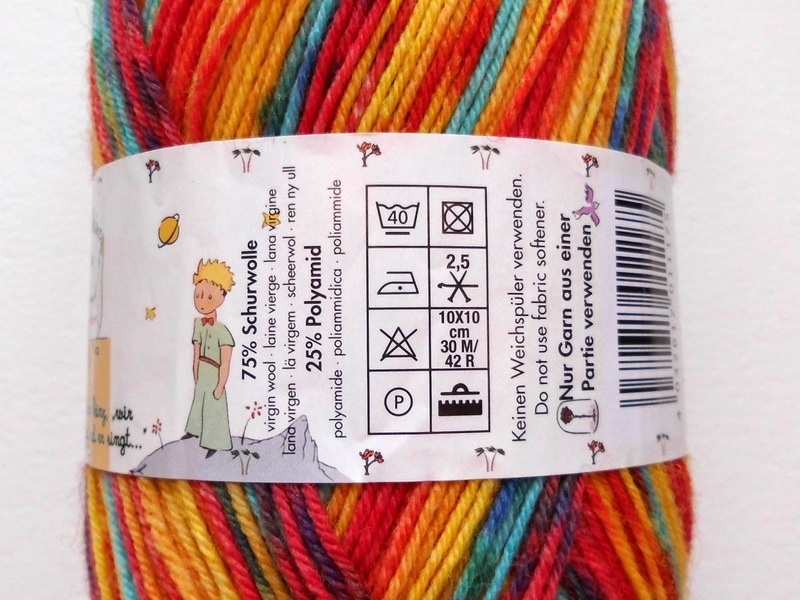 What should I do if the yarn I bought doesn't list gauge info? It's from a really small company I guess, so it doesn't have that info. Should I cast on 60 and then try and stretch it around my leg to see if it will work? Good Day! 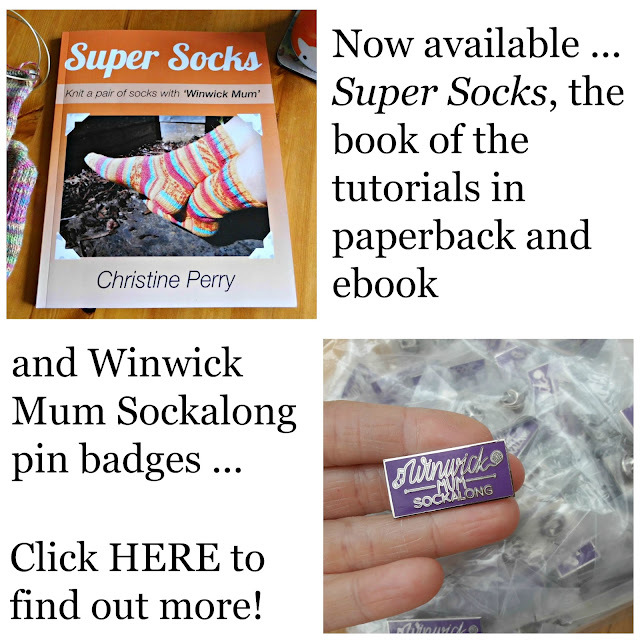 I bookmarked your sock knitting information OVER A YEAR AGO...but now I am ready to try. I bought the sock yard...it gets 28 stitches (vs your 30) per 10 cm. I've got a circular needle on a 12 inch/30 cm cable. I'm using size 2 (the next size I've got is 3). I write because just casting on is making me crazy! I have the method down but I seem to keep splitting the yarn. Could this be because I'm holding/pulling the yarn too tight? I worry that if I loosen up then the whole thing will be a loose mess (mind you, all I'm trying to do right now is the swatch! lol). Thanks for replying! I'm certainly tense and tend to hold things too tight, so I am trying desperately to relax (easier said than done). I wanted to ask you...I put the 60 stitches on my needle and rather than starting with k2,p2 for the first two rows, I started with the first row as just knit, followed by the k2, p2. I hope this doesn't create a problem? Also, won't I have to sort of "stitch" the first two rows together with my tail end that is there when I'm done since it is after that point that I've transferred the job to circulars? That's what it seems to me. I've just found your sock along posts and am very excited to start. The information in the yarn and needle posts were very helpful and make me feel this is doable. Thanks for taking the time to write this all out and share it! Do you have to wash and block the swatch or is it OK to figure out the tension from the stitches off the needle? If I'm using dpns instead of circulars should I just knit a stockinet stitch? I found your blog and sock a long via Ravelry. I'm in South Africa and I have just bought my first sets of circulars and dpns and some 4ply wool as I'm wanting to make my very first pair of socks. I've done the swatch for the wool I bought (band says 27 sts and 36 rows is a 10x10 cm [4in x 4in] square), however my swatch turns out to be 32stitches and 40 rows to get the same effect. My question is "do I just use my swatch workings or do I rather go up a needle or two size to figure out how many stitches for my socks?" My foot circumference is 8 and 1/4 inches round the ball of my foot. I did buy 2.5 DPN and a 2.5 80cm circular (couldn't find a shorter one where I am). the make of wool is by Elle and is natural cotton which is what I can wear and work with (severe allergies to manmade fibres like acrylic wool is the reason for this). Elle is a make here in South Africa. Thanks for your generosity an easy to understand tutorials. Thank you very much.... I will try with the 56 sts cast on and I'm also going to try with the circular needles magic loop method. I don't think I can manage using the DPN's yet except for the cast on stitches. Do you do the first two rib rows on the dpn's ( I think that is how I'm understanding your pattern instructions)? I'm joining in to make my first pair of socks, but I plan to use a larger yarn, Caron Simply Soft for this practice pair. It calls for 8 needles, but I'm presently working on a small square with sz4 and its given me 6inches per inch. It is stretcy. My ball measures almost a 9. So I'm thinking I'd add 48 stitches to my needle to begin. But is even a 4 too large, should I go down to a three? This pair will just be a comfy, around the house socks.. thought it would be easier working with a larger yarn on my first pair. Any thoughts on my stitches as to the amount i should put on my needles. Thanks.